Can you believe it's Thursday already? For some reason, Mondays usually drag by for me, then Tuesday and Wednesday fly by, and before I know it, it's the weekend! I'm not complaining- fast work weeks are always a good thing! Today I wanted to share a few quick and easy lunch ideas. I mentioned in my August goals that I wanted to pack a lunch every day (spoiler alert- not going so well). I'm not really a sandwich/fruit/snack every day kind of person, so I wanted to talk about what I bring. For the most part, I love to pack leftovers for lunch, or plan out my meals on Sundays. That way, it's no extra effort and I save money (and food). Win-win! I hope you like my ideas, and I would love to hear what you bring to lunch. I'm also hosting a giveaway thanks to Sweat Pink and Freekeh Foods! Keep reading to find out how to enter :) (Giveaway is over! Congratulations to Kristen for winning!) Since I'm trying out freekeh for the first time, I'm also going to be linking up with Jess and Sara! By far, my favorite thing to bring for lunch is a healthy side dish with a protein. It's really easy when prepping for the week, because you can make one big batch and divide it into separate dishes for each day of the week, and you're done! First, I made a salad with freekeh as a base and added edamame, cucumbers, Gala apples and Pear Champagne dressing from Trader Joes (my favorite). I also added in some goat cheese for creaminess and salmon for protein. It was my first time trying freekeh (I received two packages to try from Sweat Pink) and I loved it! It was a perfect base for a salad like this and had a nice little crunch. I'll be giving away a package of freekeh in the flavor of your choice, so be sure to read instructions on how to enter at the end of the post! Next, I have a bean salad- made up of black and navy beans, cucumbers, tomatoes, red onions and kale. I brought in some frozen chicken to mix in. Nice and simple! Sometimes, I'll be lazy and just bring in frozen chicken or other protein, and buy a side dish to mix in. Even easier, and saves some money rather than buying a full meal! I love to have a mixture of different foods in my lunch, and creating your own Bento Box is a fun way to eat. I find a lot of exotic foods at Trader Joe's as well as the Strip District in Pittsburgh. It's fun to try out different cuisines and have little tapas for lunch! This one is my Greek-inspired Bento. I included grape leaves, cured meat, cheese, marinated artichokes and mushrooms, and a lentil salad (lentils+kale+tomatoes). There's also lots of ideas over on the Organized Bites website. Seriously..how cute is this Charlie Brown-inspired box!? I may be 25 but I would love having that for lunch! Who doesn't love sushi? It takes a lot of work to learn the technique to make it, but this free-form version has all the same great taste without making Jiro Ono cry. I started with a base of quinoa (you can use rice or freekeh as well) and topped it with smoked salmon, cucumbers, tuna/mayonnaise mixture and seedweed snacks. This is completely custumizable for the type of sushi you like! Jenny just posted her newest Takeout Fakeout recipe of a pan sushi roll, which I am trying ASAP! The way she made this would give you multiple servings. Sushi for lunch everyday? YES PLEASE!! 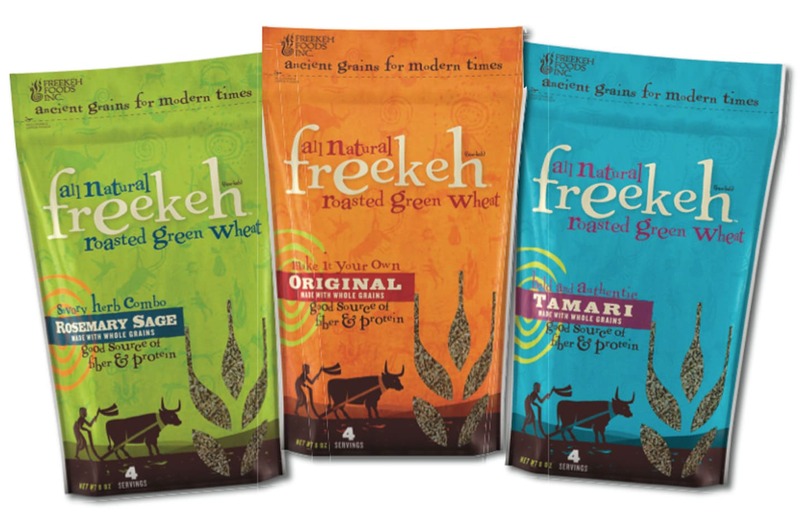 Freekeh Foods is giving away a package of freekeh in a flavor of your choice: original, rosemary sage (my favorite), or tamari. There's so many different recipes to use this amazing grain, and I can't wait to try them all out (check out some ideas here- I think I'll make the Warm Breakfast Freekeh next). sorry, but giveaway is for U.S. residents only! Please leave a separate comment for each method you're using to enter, and I'll announce a winner on August 31! lunch is always a tough one for me, especially when I needed to plan it ahead to take with me! I am not a sandwich person either so I usually went with big salads prepared in advance with lots of roasted vegetables but half of the time, it wasn't what I even wanted. don't ask me what it is I wanted because I really don't know, although, I could probably live on frozen yogurt for lunch and not complain! I typically eat lunch on the go or at work (waitress) so I guess it would be a tuna salad or egg salad sandwich stuffed into a flatout wrap :) I love omelettes if I have time though! I love those too! I wish they didn't smell though..I feel bad bringing them in since I eat at my cube! um, how amazing is your free form sushi, and that pan sushi? yum! sushi can be so expensive when i buy it already made so i totally want to try this. I have never had freekeh before. i have been trying to eat out less as well, like you it isn't going so well for this month lol!! I love getting frozen chicken! It's probably not the healthiest option, but it's really quick and easy. I'll also try to cook a big batch of chicken at the beginning of the week, but sometimes I'm just lazy! I really love the first salad you made. It sounds absolutely delicious and super refreshing in the hot summer! Thanks Jamie! It turned out really well I think! Your bean salad looks amazing!! I actually got that one from Bluebird Kitchens, but I have to try to recreate it! It was so good. I love the name of it: Freekeh. The name alone makes me want to try it out! Hi Gretchen! I loved trying Freekeh. And I love your lunch ideas. Bento Box? Totally cool! I'm following Freekah on Twitter! :) Thanks for the giveaway! Thanks for stopping by and entering Ashley! Glad you liked the bento box idea. It's so good! I want to try that pan sushi so much! Sushi is my weakness. The Strip District always has such interesting ideas too. Every time I go grocery shopping downtown, I always come home with some new ingredient that I have no idea how to prepare but I try to cook anyway. I tweeted about it! :) I would love to try this. And I <3 how much you seem to like Oriental food. I'm 1/4 japanese, so I have an affinity for Oriental food, having grown up with it! I love trying new cuisines! Chinese, Japanese, Thai, Indian, German, Italian..all good in my book :) Thanks for entering Emily! I pack a lunch nearly every day, maybe 1-2 days per month that I don't have time. For me, it really helps to do all of the food prep on Sundays so in the morning it is just grab and go. Lately my favorite lunch is pizza. I'll make a homemade pizza on Sunday, wrap the slices individually, and grab a slice every day. Plus with homemade I can use whole grain crust and control the toppings. I pair it with some veggies and fruit to balance out the unhealthiness (actually I don't think it is that bad at all since I need the carbs to fuel my runs). [not entering the giveaway because I participated in the campaign as well] I'm having a hard time packing lunches, too! I think what would help is if I planned the night before, and even if I packed my lunch. When I go back to school this year I will be teaching in a different facility in which I do not have a fridge or microwave in my room like I did before. This means i'm going to have to be more creative on what I pack for lunch. I'm really gonna try to keep it as healthy as I can though. I love how you made the tuna fish salad healthier. Great idea ! I've also heard of substituting greek yogurt for mayo..have you tried that? I might have to make one for lunch sometime soon (hopefully it won't be too stinky). I follow freekehfoods on twitter. I'm glad someone else likes grape leaves as much as I do. They are seriously the best. I know right! I absolutely love them. Ahhh! How have I never heard of freeform sushi? Such a genius idea! I'm so impressed with all of your healthy food choices, Gretchen. Thanks for the inspiration! Love the sushi ideas. I may have to venture down to the Strip, to make a stop at Wholey's and then the Asian market. I love to make lunches that freeze well. I'm a Sunday meal prepper. Usually I'll try to make 6 portions of something, and freeze 2, then, I've got a slightly rotating stock so I don't have to eat the same thing every day, and if I ever miss meal prepping it doesn't leave me running for take out. This week I made a super simple curry (1 can coconut milk + 14 oz can diced tomatoes, juice & all + 6 oz can tomato paste + 3 TBS curry powder) I add diced onion, pepper & spinach too. I serve it over rice/cauliflower with chicken. So tasty, and the curry freezes really well! Thanks so much for all those ideas Jessie! Definitely trying out that curry..one of my favorite foods! Your freekah recipe looks amazing! I enjoy edamame in about anything! Thank you!! Same here...it's amazing. I've never tried it but would love to! My lunches are always leftovers from dinner. Tomorrow's lunch will be Spicy Mushroom Stir Fry, with shrooms cooked in a veg broth/soy sauce/sweet red chili sauce plus spices and mixed with brown rice and cubed tofu. The bean salad sounds great! I usually have a set supply of lunch and breakfast items--cheeses, quick smoothies, homemade cookies, etc., and a variety of each. Then I make enough dinner to have leftovers available for lunch. Your sushi may be a life-changing idea! Thanks for stopping by and entering!! Bentonville box lunches are awesome. I like to serve organic strawberries and organic cashews, organic cheese and organic broccoli. I love the Takeout Fakeout recipe of a pan sushi roll! Such a great idea! I like to make avocado wraps, filled with lots of veggies for lunch!